On Thursday, April 19, Eric Kunnen and Hunter Bridwell from eLearning, along with Kristofer Pachla, director of the GVSU Regional Math and Science Center, attended a round table discussion focused on augmented reality at Miller Johnson offices in Grand Rapids. Hunter and Eric had an opportunity to share how GVSU is exploring augmented and virtual reality through the Atomic Object Technology Showcase. They also were able to experience the innovative DAQRI helmet and smart glasses first-hand! In the article, Erica Hamilton, professor in the College of Education was interviewed about her experiences with students visiting the showcase. A place to explore the latest in technology and bring your ideas to life! 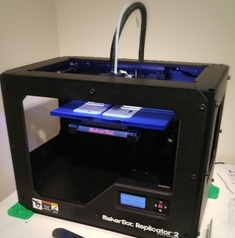 Did You Know: Faculty, staff, and students at GVSU can now print 3D objects… for FREE! Why: The Atomic Object Technology Showcase exists to serve as a place to showcase new technologies and introduce the students and faculty of Grand Valley to emerging technologies. All of the technologies have an educational component to them, and could be used to help both student learning and professor teaching. 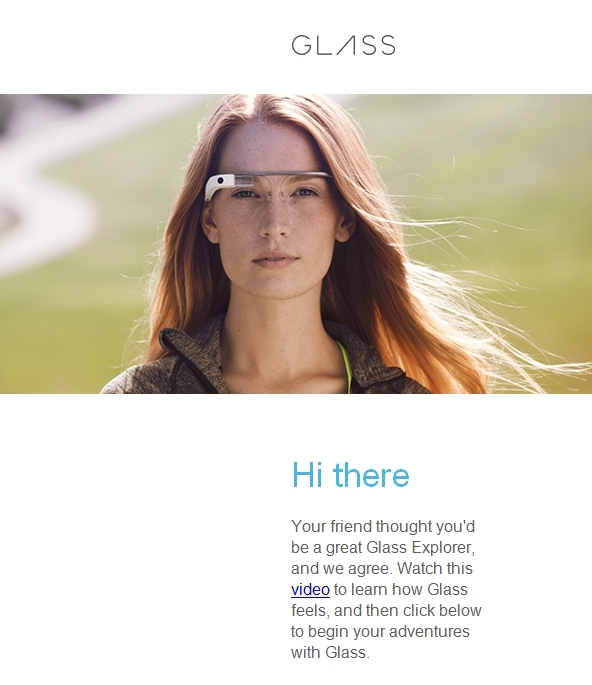 What: This is the fun part… all the technology! We have over 30 different advanced technologies, from Google Glass to 3D printing. 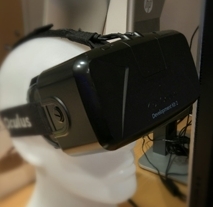 The Oculus Rift, immerse yourself in a 360 degree, 3D world! 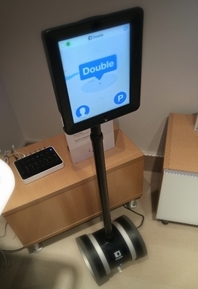 The Double Robot, A telepresence machine that lets you be in two places at one! 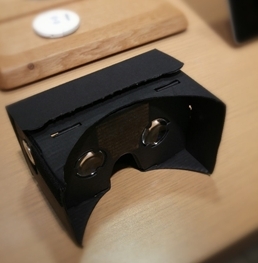 Google Cardboard- Like the Oculus rift, but for a fraction of the cost! What To Do Now: Come in anytime we’re open and see what we have to offer! Kelsey- “My favorite technology is the smell one”- by which she means our newest piece of technology, the OPhone! This gadget can recreate smells on the fly! This post was written by Travis Brubaker, Emerging Technology Specialist and student assistant in the showcase. Learn more about the Atomic Object Technology Showcase. In a short amount of time, the Technology Showcase, located in room 012 of the Atrium in the Mary Idema Pew Library Learning and Information Commons has grown to become an exciting and compelling place for students and faculty to come together to share ideas and to have a dialogue around how educational technologies can advance teaching and learning at GVSU. Most recently, the showcase was featured in the Spring Issue of Grand Valley Magazine. In addition, a GVSU YouTube channel video about the showcase was created to capture the vision of the showcase moving forward. It’s exciting to work with faculty and students to help shape the future of education! 3D printing offers all sorts of potential and possibilities! GVSU’s Mary Idema Pew Library Learning and Information Commons has two 3D printers that are available to students and faculty. 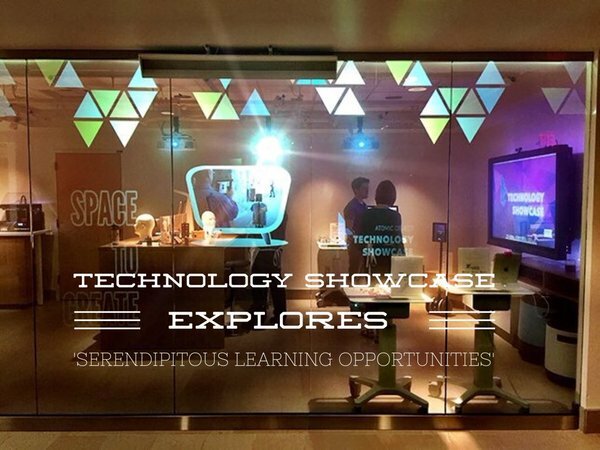 Every Tuesday and Thursday the Technology Showcase (Room 012 Atrium Level) in the new library hosts a demonstration from noon to 1:00. Have a question? Want to see a 3D printer in action? Stop by! Learn more about 3D printing at GVSU on the library Makerspace page. The Makerspace is a lab for you to create, tinker, and explore. There are two 3-D printers and specialized modeling software for use by current GVSU students, faculty, and staff. Also, are you interested in making? Do you tinker? Would you like to create? Check out the GR Makers space located in Grand Rapids.